Mix visuals and effects on up to 12 layers, compose them together with transparency and masking modes - or send each layer to a different output to create a large scale projection. MediaMaster Express has proven to be an ideal solution for small to medium sized video installations in various venues such as Theatres, Clubs, Bars, Shopping Centres, Advertising displays, Sports Stadiums, Shops and even Fitness clubs..
MediaMaster can play and mix the audio track from your movie files. This feature, which comes with global audio volume control through DMX or MIDI, turns your controller into a professional A/V mixer. MediaMaster also comes with audio reactive visualizers as powerful visual animations creating nice ambient visuals, perfect for clubs, live DJ performances or LED installations. Even better, LED fixtures compatible with ArKaos’ Kling-Net protocol will connect and configure themselves automatically. No more complicated setup process, forget about the IP addresses! Want More? You Can Get More! You need to work on bigger setups? 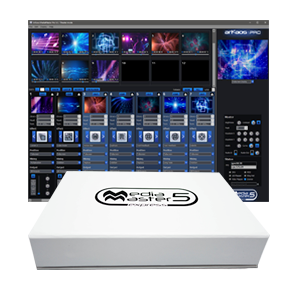 No worries, MediaMaster Express is the perfect solution to start with, but if you want even more professional control you can always upgrade to MediaMaster Pro and get access to expert features such as MSEx compatibility, full fixture mode, advanced soft-edge & geometry correction, the new Video Mapper Extension and much, much more..
Go For A Full Demo! Want to try it? Download the MediaMaster Express Demo Version and start playing immediately!